Do we have a U.S. Attorney General, or are we waiting for the Senate to confirm Trump’s A.G. nominee? 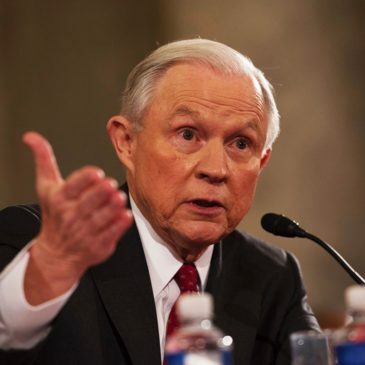 Answer: I am pretty sure Jeff Sessions was confirmed by the Senate to be Attorney General, but the lack of definitive actions by the Justice Department since his confirmation actually questions if there even IS an A.G. Very little has been initiated by Justice even though there are numerous happenings at the federal level that cry for criminal investigation. Former FBI Director James Comey lied on numerous occasions in sworn testimony before Congress and in public interviews. I know: lying to Congress (even under oath) is not a criminal action. But the lies told by Comey reveal very obvious criminal violations that seem to Americans to be overlooked by the Justice Department. If average Americans committed those acts, their lives would already be in uproar because of criminal investigation for those. Hillary Clinton There are those that will throw rocks at me for even bringing it up. Just for a moment forget about any possible political partisanship in this case. (And, yes, there IS a case there) The Justice Department MUST re-open the case against Hillary Clinton, her staff members, AND her campaign for the mishandling of classified information through her use of that unsecured server, AND subsequent hacking success of foreign entities who have gained access to that information. Walking away short of obtaining factual information exonerating those involved in that would be a tremendous disservice to the American people. I am NOT speaking of any Russian collusion here — this is just about the email controversy regarding mis-handling of classified information. Debbie Wasserman Shultz. Has everyone forgotten about her? Reminder: on her watch, a group of foreign IT specialists managed the IT systems for Congressional Dems and their offices, the offices of the DNC, and Wasserman Shultz’s computers as a member of Congress and head of the DNC. Members of that group were arrested for suspicion of mishandling data from those systems and making that information available to foreign entities. All of this happened not only on Wasserman Shultz’s watch, but with her endorsement, AND with the payment to those people of millions of dollars. Is there a DOJ investigation underway? Susan Rice. Former White House NSA Adviser Rice has been accused of the unmasking of American citizens under the guise of intelligence gathering, but for political purposes. She has categorically denied doing so — even though she unmasked numerous individuals using “foreign intelligence” as the excuse. Her doing so (if truthful) is a federal felony. Samantha Power. Why any United Nations ambassador would need the identities of American citizens unmasked is unfathomable. Yet Obama’s UN Secretary Samantha Power reportedly had several hundred such names disclosed. She too needs to be investigated for potential felonious actions. DOJ Deputy Director Rod Rosenstein. I know it is a bit sensitive to consider investigating a current leader in the Justice Department, but Rosenstein is deeply involved in every part of the Russia investigation, the Clinton email investigation, and others mentioned above. His close ties to those being investigated certainly reeks of conflict of interest if not Obstruction of Justice. He should recuse himself and take a leave of absence while an FBI investigation into his potential illegalities is underway. There is NO plausible explanation for his being in the position in which he is now, managing these ongoing matters and potential criminal investigations. His longtime relationship with Robert Mueller brings into question even his appointment of Mueller as Special Investigator on the Russia-Trump Campaign investigation. Former Attorney General Loretta Lynch. Who can forget the secret meeting of Lynch and Bill Clinton on the Sky Harbor Airport tarmac in Phoenix? A meeting between the two would be a nothing burger IF Hillary was not already under investigation by the FBI, and an FBI investigation of the Clinton Foundation was not under consideration. Lynch said they discussed golf and grandchildren — for 30+ minutes! No matter if their discussion was about just those two things, their having that meeting was highly improper and it by itself could be considered Obstruction of Justice. It certainly warrants an investigation. Former President Bill Clinton. There is no doubt that Bill leveraged Hillary’s position as Secretary of State under Barack Obama for dollars. His speaking fees doubled and even tripled with Hillary in office. Both Clintons emphatically deny using her political position and access to the State Department as a lure for bigger and more profitable speeches by Bill. Yes, much of those fees were paid to the Clinton Foundation. But most people feel that entire process was a “pay for play” action in which countries, foreign corporations and individuals were used as a scheme for access to Hillary: pay Bill to give a speech, (and pay really BIG) and you’ll get a meeting with Hillary. This scheme is now more obvious than ever as we have watched contributions to the Clinton Foundation virtually dry up in the last year. Why? Hillary did not get elected and therefore countries, companies, and individuals no longer need access to Hillary. I am certain there is a “there” there. The DOJ should be already deep into that investigation. Peter Strozk and Lisa Page. Come on: is there any question that the actions of these FBI officials should initiate an immediate Department of Justice investigation? These two documented through their thousands of text messages an apparent underground process apparently created to informally impact the 2016 election in favor of Hillary Clinton. Who knows exactly what illegal actions were taking place on their watch? NOBODY AT DOJ APPARENTLY DOES RIGHT NOW! Their discussions demand immediate answers to questions that pop up about what was actually going on at the FBI, what was legal and what was not. Investigating this is definitely necessary. Uranium One. The American public has heard this pay-for-play story for months now. And the American public has received no answers. There is much finger pointing about the sale of these U.S. uranium assets that ended up in ownership by a Russian company controlled by Russian President Vladimir Putin. All we hear from the Left is that Hillary Clinton — though on the committee that must approve the sale of U.S. assets to foreign entities — did NOT cast a vote in favor of approval of this sale. Maybe so. But in short order, millions of dollars of contributions to the Clinton Foundation were made by owners and management members of Uranium One — a little too significant to summarily dismiss. Remember this: Hillary signed an agreement with Obama stating that the Clinton Foundation would NOT accept donations from foreign entities of any kind while she was Secretary of State, specifically to prevent any possible conflicts of interest. Not only did they gladly accept these contributions, the Clinton Foundation received millions from other foreign individuals and companies during her State Department stint. We need to get facts. The Steele Dossier. I will complete my considerable list for A.G. Sessions with this one. It has now been proven that the DNC along with the Clinton Campaign paid for the production of the Steele Dossier that was at least partial evidence presented to the FISA court to justify the issuance of the FISA warrant to surveil members of the Trump organization. According to details released so far, this information was withheld from the application for the FISA warrant and subsequent renewals of that warrant. Jeff Sessions regrettably recused himself from any investigation regarding the 2016 Presidential election and campaigns leading up to November 2016. But he did NOT recuse himself from initiating and even leading DOJ investigations as detailed above. Wow — there’s plenty of fertile investigation ground out there! Certainly some of these investigations are probably underway already on his watch. Remember: the DOJ and FBI do not announce to the public when they embark on or even details of ongoing investigations. That being said, in the “leak” environment that permeates the Federal Government, it is uncanny that IF some of these investigations are underway we know nothing of them. I hope that is not the case — that A.G. Sessions is deep into fulfilling his role as chief legal authority of the Nation. Unfortunately it appears to me that Jeff Sessions, while being a really nice guy, is one who is not aggressive in investigatory or prosecutorial actions. I hope I am wrong. “If” I am correct and there is any way for the White House to verify Attorney General Sessions is not pursuing most of (or some of) these investigations, he should resign his office immediately. This Administration must have the head of its Justice Department representing the American people, aggressively attacking those who have taken advantage of the United States and its citizens in jeopardizing the actual “rule of law” by which American Justice has been operated for more than two centuries. Yes, “Innocent until proven Guilty” is the Constitutional guideline to protect the innocent in the U.S. But without swift, intense, and accurate investigations of the facts of every potential criminal matter, justice cannot be served. Attorney General Sessions MUST step up and fill that role, OR someone else must. ← How Broken Is It? With the over 13K sealed indictments now in place in DC maybe and just maybe AG Sessions and his team have been working hard and keeping quiet. That would mean that at some point they unseal the indictments and all heck breaks loose.